What would our world look like if everyone who called themselves a follower of Jesus Christ lived by a Christian code of conduct? Not too long ago, I took a trip on a buddy pass with a particular airline who had a code of conduct attached to the ticket. This code of conduct outlined how I was to dress and act while on the plane; since I represented the airline by using an employee buddy pass. That got me thinking about other codes of conduct’s. You may have heard of these. Realtors and Financial Institutions follow a code of conduct called The Code of Ethics. Some are even fired if they are caught violating them. The Armed Forces swear in by promising to live by The Code of Conduct for Members of the United States Armed Forces. Most schools require students to follow an Honor Code. Even employers will enforce a Dress Code. The purpose of these codes, are to convey an expectation of behavior. The culture in our society today makes it difficult for the world to distinguish Christians. While we can’t take responsibility for our brothers and sisters in Christ who act like the world, we can take responsibility for our own conduct. Just because we are free people in Christ, does not mean we live freely without care and regard for the God we serve or others. After contemplating on this for a while, I found myself wondering if there was a Christian code of Conduct in the Bible? As I turned to God’s Word for answers, I discovered Romans 12 is actually titled; Christian Conduct, and in The Message translation it’s titled; Place Your Life Before God. How fitting! So, let’s read Romans 12 together. 20-21 Our Scriptures tell us that if you see your enemy hungry, go buy that person lunch, or if he’s thirsty, get him a drink. Your generosity will surprise him with goodness. Don’t let evil get the best of you; get the best of evil by doing good. When I study the Bible, I’m the type of person who has to; write out a passage, underline it, circle words, and pull each verse apart. Needless to say, I’ve done this with this chapter and taught on it before. However sharing those notes would make this blog post entirely too long. Therefore, I’m going to summarize my notes with a cliff note version. If there were a Christian Code of Conduct based on Romans 12, it would look something like this. 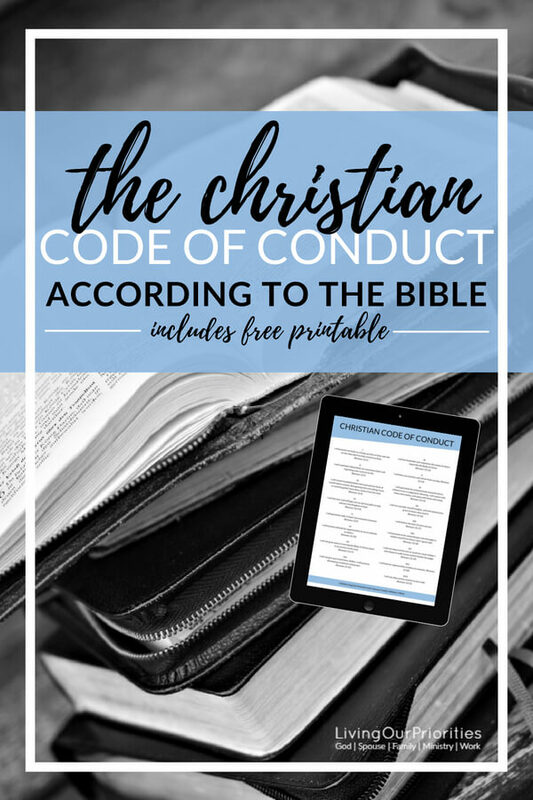 Note: You can print the Christian Code of Conduct from our library under the Faith section. Could you imagine, if each of us made a personal commitment to follow Romans 12 on a regular basis? I’m not going to lie this is tough to walk out. But we can’t develop in any area of our life without having the opportunity to develop. The good news is, God will develop us into completion. Our conduct can infiltrate the people around us, and touch some of the hardest hearts. If we CHOOSE to maintain our conduct in line with the spirit, instead of our flesh. So I ask you again, what would our world look like if everyone who calls themselves a follower of Jesus Christ lived by a Christian Code of Conduct? PS…You can download the Christian Code of Conduct from our community library under the Faith section. If you need the password fill out the form below. This post is being shared on Grace & Truth A Weekly Christian Link Up!